Anantara Si Kao Resort & Spa, south of Krabi in a hidden corner of Thailand, has launched a series of rock climbing courses which range from a simple half-day workshop to a thrilling three-day journey that will test participants to the limit. Each course is designed to be fun and challenging for the beginner climber through to an advanced level. The stunning natural environment around the resort offers the perfect setting to embark on a thrilling new activity that promises to take participants out of their comfort zone! Safety is paramount on the courses and the trained instructors will attend to every individual’s needs and requirements to ensure they scale new heights in terms of their personal achievement. The courses will give climbers an opportunity to experience the beauty of the diverse geography of the Sikao area including white powdery beaches, majestic limestone cliffs, virgin rainforests, rich mangrove reserves, hidden caves and rushing waterfalls. 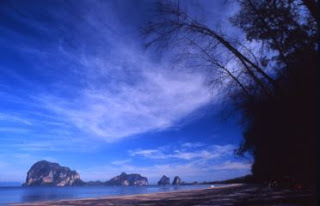 Each day, climbers will travel to Ao Ton-Sai Beach, just a 20-minute ride by longtail boat from Ao Nang Beach, to learn new skills or improve their technique. Then at the end of their exhilarating adventure, guests will retreat to the laid-back luxury of Anantara Si Kao. The resort offers 138 guest rooms and suites, each featuring private balconies overlooking the ocean or the Bill Bensley-designed tropical landscape. The Anantara Suites offer expansive space, oversized bathtubs and polished teak furnishings, while the Anantara Pool Suites boast their own private plunge pools.